The letter Micheál Martin has sent to the Taoiseach. 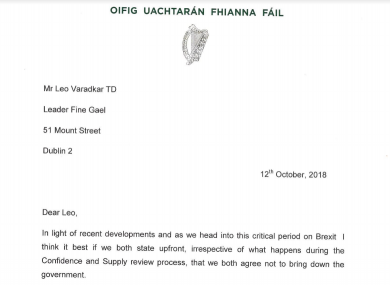 FIANNA FÁIL LEADER Micheál Martin has written to Leo Varadkar and has told him he thinks it’s best if they both agree not to bring down the Government and force an election. Fianna Fáíl is currently propping up the Fine Gael government under the Confidence and Supply agreement – where Fianna Fáil agreed to back the Government on issues such as the budget. In light of Denis Naughten’s ministerial resignation yesterday, Martin sent the Taoiseach a letter to state he has no desire to force the country to the polls and implored his counterpart to say likewise. “Dear Leo. In light of recent developments and as we head into this critical period on Brexit, I think it best if we both state upfront, irrespective of what happens during the Confidence and Supply review process, that we both agree not to bring down the Government. “The Irish people would, I am sure you agree, be rightly concerned at any risk that a general election campaign would have on these talks at such a crucial period and an uncertain post-election situation. A government spokesperson said this evening that it is agreeing to extend the Confidence & Supply Agreement until the summer of 2020. The best way to guarantee that there won’t be an election is to start talks and take them forward promptly, allowing the current arrangement to continue providing stable government until at least the summer of 2020. Email “Micheál Martin writes to Leo Varadkar urging him to say he won't call an election”. Feedback on “Micheál Martin writes to Leo Varadkar urging him to say he won't call an election”.